Previous post: The full manuscript! Finish the major edits by March 12. Right now there are still lots of notes to “Write example here!” and “Rewrite this section!” in the text, and a lot of minor inconsistencies. My goal by March 12 is to have a “clean” draft that I can show to an editor. Send draft out for review on March 12. I’m going in for surgery on the 12th (removing a benign tumor), which means I’ll probably be unable to write much for a week or two. That makes it the perfect time to send it out to my editors and beta readers for them to read and comment. Get the draft into near-final form by April 30. That means incorporating all editorial feedback and finishing the restructuring. At this point I might be doing line edits to polish up the text, but not wholesale revisions of entire chapters. In particular, the draft needs to be good enough to go out to the artisans whom I’m quoting, so that they can review the quotes in context and send me any requested photos. Get all photos and permission forms from artists by June 12. Of course this depends on getting artist responses in time, but six weeks should be enough time to work out details for anyone who is willing to send me something. Finish line edits by June 12. At this point the text should be fully polished. The only changes should be photo captions. Reformat the text into the publisher’s required format by July 12. Schiffer has a particular format for tagging text, and I expect it to take 2-4 weeks to reformat a 40,000+ word manuscript. Send the manuscript to the publisher – August 1. You’ll notice that there is nominally nothing to be done after July 12. This is intentional – I’m giving myself 2.5 weeks of time in case something slips in the schedule. In particular, my surgery recovery time is a big unknown – anywhere from 2-6 weeks, according to the doctors involved. Being a project manager, I have also sneakily held back an ace or two. I have booked the cottage in Ft. Bragg from July 18-26, so that just in case I’m running way behind, I can hole up and dedicate another full-time week to finishing. How do I plan to get this all done? I’m planning to do twelve hours of focused work per week for the next 26 weeks – 1 hour/day on weekdays and 3.5 hours/day on weekends. I think that is a sustainable pace, and adds up to about 8 weeks of full-time work over the course of six months. If it isn’t enough, I can try bumping it up by about 25%. But 15 hours/week may not be sustainable, considering I also have a full time job (and would like to weave at least a little!). 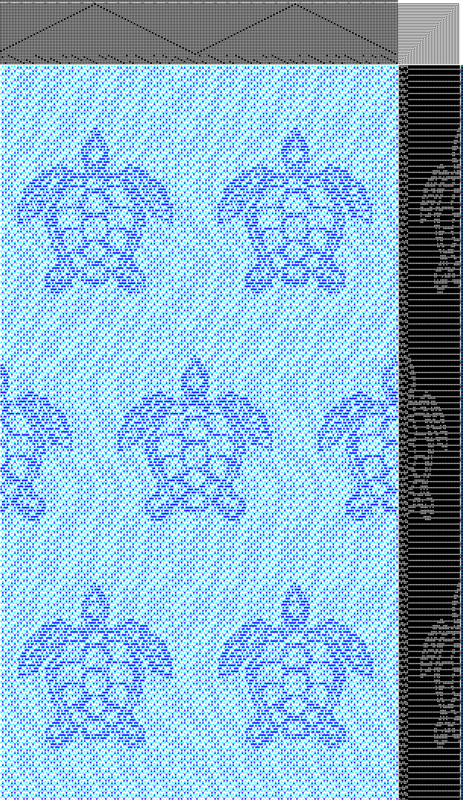 Speaking of weaving, I’ve decided that the next thing on the loom will be the sea turtles. I need some 24+ shaft designs for a sample exchange due in March, and some cloth in fine threads for a sample exchange due a month or two later. The sea turtles should satisfy both requirements, and if I get started now I will probably be able to finish in time. I can also weave a scarf or two on the same warp. 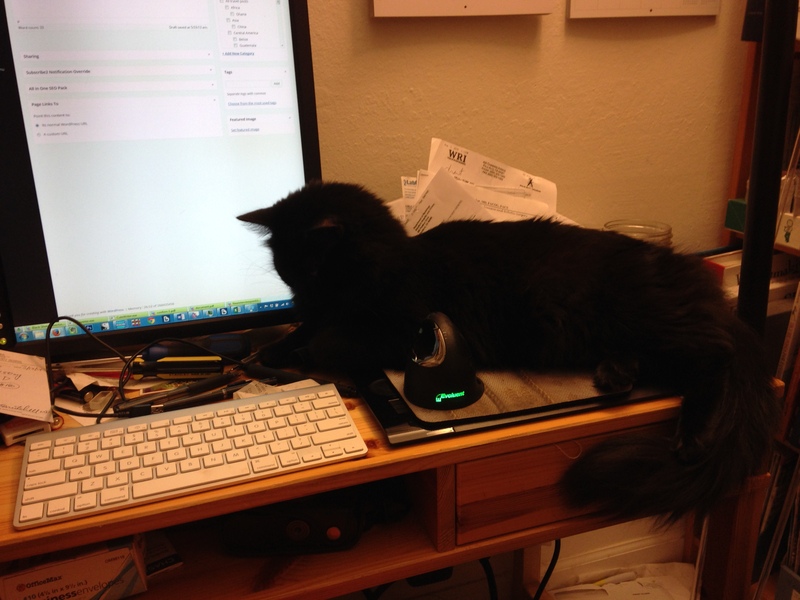 I’m sure, of course, that leaving space for the mouse (and thus allowing me to get some work done) is just an oversight that will be corrected before long. So I’d best be off to write my book!